Jamie McGonigle and Howard Beverland were on target for their respective sides at The Shorgrounds. Coleraine and Crusaders shared the spoils in an enthralling encounter at The Showgrounds. 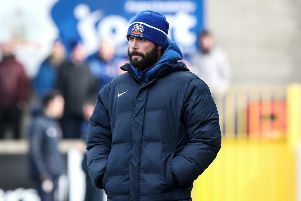 Jamie McGonigle fired the Bannsiders in front midway through the second half, before Howard Beverland rescued a point for the visitors with 12 minutes to go. The Crues carved out the first opening with only two minutes on the clock. Jordan Owens exchanged passes with Paul Heatley, but his poked effort went past the far post. Brian Jensen had a let off on four minutes as Stephen O'Donnell forced him to drop Ciaron Harkin's free kick. The Bannsiders tried to recycle the ball but were penalised for offside. At the other end Chris Johns did well to palm away Gavin Whyte's inswinging free kick on 12 minutes. An excellent interception by Mark McChrystal on 23 minutes denied Ian Parkhill a tap in after a great run and cross by Darren McCauley. Coleraine forward, who surged into the box, his shot was blocked by McChrystal though. McChrystal was on hand to deny Parkhill again five minutes later after a great run forward by McGonigle. His lay off found his strike partner, but his goal-bound effort was blocked by the big defender. The Crues carved out an opportunity of their own on 41 minutes as Whyte's teasing low cross picked out Jordan Owens at the back post, but his effort was well saved by Johns at his near post. The keeper was called into action again by the big striker two minutes before the break. He got on the end of a great ball by McChrystal, but Johns saved well. The hosts were first to threaten after the restart. A slick passing move on 50 minutes saw Carson tee up Harkin, but his first time effort ended up on the wrong side of the post. Back came Crusaders and Brown had Johns at full length from a free kick on 53 minutes. The keeper could only parry the ball away, Whyte recycled, eventually the ball fell for Heatley who dragged his shot wide on the stretch. The Bannsiders edged in front on 66 minutes and the returning Brad Lyons played his part in the goal. He fed McGonigle who cut in from the left before squeezing a low shot in between Jensen and the far post. Paul Heatley almost added another spectacular goal to his repertoire on 78 minutes as he hooked Owens' knock down towards goal, but Johns reacted well to tip over. However, from the resulting corner Beverland headed the ball home from inside the six-yard box to level things up against his former club. Coleraine responded and but for a great block by Brown, McGonigle would have fired his side back in front again with seven minutes to go. Stephen O'Donnell should have done better after he lost his marker from McCauley's corner on 88 minutes, the big defender powered his header over from six yards. Whyte almost grabbed the win for the visitors right at the death as he latched on to Burns' throw, but his first-time effort flashed across the face of goal. Coleraine: Johns, Mullan (Whiteside 90+2), Harkin, McCauley, Smith, Carson, McConaghie, O'Donnell, Parkhill (Lyons 56), Traynor, McGonigle. Crusaders: Jensen, Burns, McChrystal, Brown, Ward, Caddell, Forsythe (Cushley 77), Heatley (Glackin 81), Whyte, Owens, Beverland.